CBT was introduced on 21st February 2011 and riders with a motorcycle provisional licence entitlement were allowed a year to take a motorcycle practical test without having to take CBT. Basically all learner moped and motorcycle riders must complete Compulsory Basic Training (CBT) before they can ride unaccompanied on public roads. In addition an Approved Motorcycle Instructor (AMI) Register, similar to that of the present Approved Driving Instructor (ADI) Register, has been introduced in order to regulate this training. Only registered Approved Motorcycle Instructors (AMI) will be allowed to conduct these training courses. Compulsory Basic Training – CBT – was introduced in Northern Ireland on 21st February 2011. The CBT scheme in NI is based on the current scheme in Great Britain, which has been in place since 1990. The training is aimed at all learner motorcyclists on NI roads. There are five elements in the CBT syllabus that will need to be covered in CBT training. The CBT Syllabus contains five elements, grouped into three modules and each module is competency based. Module 3 Element E Practical on-road riding (minimum of 4 hours). Elements A to D are not time bound; the duration will be needs driven and dependent on trainees’ ability. Element E – practical on-road riding – will have a minimum duration of four hours attached to it. The overall duration of the course will therefore vary depending on the ability, knowledge, understanding and skills of the trainee. Prior to 21st February 2011 – Learner motorcyclists who have provisional entitlement prior to 21st February 2011 – must complete CBT – or pass their motorcycle test – within 12 months of introduction if they wish to continue to ride unaccompanied on a public road. This includes full car licence holders who are automatically issued with provisional entitlement for motorcycles after they pass the car practical test. From 21st February 2011, all new moped or motorcycle riders applying for provisional moped or motorcycle entitlement will have to successfully complete CBT before being permitted to ride unaccompanied on public roads. After 21st February 2011 – Anyone who passes a full car test and receives full moped entitlement on their licence after 21st February 2011 will have to complete a course of CBT once in order to validate this full moped entitlement for life. In other words you will have to compete a course of CBT to ride a moped or motorcycle on the road. You will not be able to ride a motorcycle or moped on the road unaccompanied until you have a valid CBT certificate. Before 21st February 2011 – However, those who passed a car driving test before 21st February 2011 will retain full entitlement to a moped licence. They will be able to continue riding a moped without completing a CBT. In effect, persons riding a motorcycle using provisional entitlement will have to complete CBT prior to riding on public roads, whether this entitlement is on a separate provisional licence, or part of a full driving licence. In essence any motorcyclist who does not have a full motorcycle licence will have to complete CBT, and provide a certificate as proof of completion if requested. Once completed, the CBT certificate will be valid for two years. If a rider has not gained a full motorcycle licence by the expiry date of the CBT certificate, CBT will need to be retaken and the certificate renewed. Make sure that your vehicle is a moped. Most modern mopeds are made in the style of a Scooter – Scooters come in varies engine capacities e.g. 50cc – 60cc – 80cc – 100cc – 125cc – 150cc – right up to the Honda FJS600 Silver Wing – 582cc. We have been informed that if you compete a course of CBT on a scooter with a Twist and Go (automatic transmission) type gear change and then wish to complete your motorcycle test you will be required to retake your CBT course in full on a motorcycle with “normal” gears. However you should have more experience riding on the road, then hopefully with that knowledge and ability, your AMI (Approved Motorcycle Instructor) should take account of your experience and the time spent on Element 1 & 2 of CBT will not require as long to take compared to a new rider. With only the minimum time after that for the on-road part – Element 3 – 4 hours minimum in Northern Ireland. The AMI register has been introduced in order to regulate the qualification and approval of motorcycle instructors who will provide on-road motorcycle tuition and CBT training. As a basis, the AMI scheme will be similar to the ADI scheme which is currently in place for learner vehicle drivers. However, this scheme will be aimed specifically at those wishing to teach learner motorcyclists. An AMI will issue the CBT certificate once a learner has reached the standard expected within the CBT scheme. AMIs will be permitted to conduct training for motorcycle and moped riders for hire or reward and be permitted to conduct CBT courses. An AMI will have photo identification to identify that they are permitted to conduct training and permitted to conduct a CBT course. The DVA (Driver Vehicle Agency) will not be setting a fee for CBT training. This will be set by the industry – Instructors and Training Schools. We believe that initial rider training in whatever form it is presented is crucial for novice riders. CBT will provide “off road” and “on road” training elements, giving new riders the basic instruction of how to handle a motorcycle on public roads. There will be a cost to this of course, but we would expect that this cost will be kept to a level that is affordable. For Right To Ride, the most important change in tandem with the introduction of CBT, will be the introduction of an AMI register to regulate the qualification and approval of motorcycle instructors, so that trainees should know that they are getting instruction that is both professional and regulated. The introduction of CBT in Northern Ireland is linked to the introduction of 3rd European Driving Licence Directive (3DLD) which is designed to harmonize motorcycle licences across Europe and enters into force as of 19th January 2013. The 3DLD will introduce a progressive and direct access licensing system with CBT as a starting point for riders, if they wish to progress to a larger motorcycle in various steps. Along this progression (still to be decided) there are various tests or training to progress to the next licence category (there are 4 in total), which includes the introduction of a Direct Access Scheme (DAS) to larger motorcycles if over a certain age. However we must remember that CBT is basic training which has been formalised to an approved standard, CBT is the starting point for learning to ride and remains the basic training that you must complete. 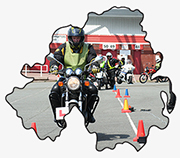 Even after completing these various compulsory stages, riders have available to them voluntary post rider training to achieve an advanced motorcycle test, either through private commercial trainers, IAM or RoSPA or the PSNI BikeSafe one hour assessments which are designed to introduce riders to advanced training. Ideally through compulsory and voluntary training we should have riders that have the requirements, skills and knowledge to ride safely on our roads. Riding a motorcycle is a learning curve, interaction with other riders and drivers is a skill, but there is another element of riding which is fun and the simple pleasure that riding a motorcycle offers. MAG Ireland report that the RSA (Road Safety Authority) are expected to introduce new regulations surrounding driving licences and the provision of compulsory basic training for car drivers in August 2010. MAG Ireland has long called for CBT for all road users and not just for motorcyclists. Motorcycle CBT had been scheduled for introduction in November 2009 but was delayed indefinitely. It now appears that CBT for all road users is on the verge of being brought in. MAG will now seek to clarify the RSA position for the benefit of Irish motorcyclists. It is absolutely ridiculous that a driver with a full motor car licence has to do the CBT – absolutely scandalous, simply a way of getting more money from motorists. I am trained to drive on the road and no way is it necessary to do a CBT for a L licence on a motor bike- I have also been a L plate motorcyclist for 4 years and do not intend to take the test as I have no interest in riding a bike over 125 cc so form now on I will simply drive my car – adding to pollution on the roads and using of natural and unsustainable resources. Hi can anyone tell me when the CBT test will be coming into N Ireland I was given two dates. Nov 2010 and 2013 ? With links to the NI Direct Gov and DVA websites at the bottom……..
We have learnt that the planned introduction of CBT is now February 2011. Any idea when the Direct Access Scheme will be available in N.I ? Will this allow you to ride a bike of any size, having completed the course? Direct Access should be available here through the implementation of the 3rd EC Directive On Driving Licences. This directive must be transposed into national legislation by 19th January 2011 and enter into force as of 19th January 2013. So the simple answer is 2013 and you will have be age 24 years – this is increased from the 21 years at present. Re your second question – yes! However the DOE put out a consultation which can be found at http://www.righttoride.co.uk/?page_id=964 the directive allows member states some lee way in what they can introduce as “law”. We are waiting for the outcome on this consultation to see what they will actually be putting forward. I’ve a question regarding the CBT Introduction. The handout came through my door and states that those with provisional moped/bike entitlement have a year to either Pass the Test, or Complete the CBT. It then goes on to say about Full Licence Holders having to complete the CBT. I’m 17, and have only just passed my Car Test (November 2010) making me a Full Licence holder, but I’m confused now as to whether I have the year that I would have had if I didn’t gain my car licence (Full Licence), I have had the moped for a year since I was 16, and have now been riding a Honda XR125, so I do have provisional entitlement for those as of now, but does my Car Licence change where I stand as regards to the CBT? Anyone who can shed some light on this would be great. Those who passed their driving test in a car prior to the implementation date will retain their full moped entitlement without having to complete a CBT course. So our take on this is you have a full car licence which entitles you to retain a full MOPED licence. However as you are riding a 125cc machine on a MOTORCYCLE provisional licence it would seem that you will have to complete CBT for this. They also state that you are encouraged to pass a full test. So the option would be pass CBT or pass a full test within the twelve months after the introduction of CBT. Hope this helps and isn’t more confusing. So, as a holder of a full car license (obtained before the legislation came in) riding a 125cc cruiser style bike on L Plates, can I ride a 125cc bike, or can I only ride a moped? I don’t bloody understand this……… and I would rather not have to sell my friggin’ bike cause of some stupid piece of legislation! Surely the law will be regulating the cc size rather than the vehicle type…..
Learner motorcyclists who have provisional moped or motorcycle entitlement prior to the introduction of CBT will be encouraged to either pass the test or complete a CBT course as soon as possible as they only have 12 months from its introduction to continue riding a moped or motorcycle on public roads without either a full licence or a CBT certificate. So yes you will only be able to ride a moped 12 months after the introduction of CBT. The law will/is regulating cc size but power output – top speed – power to weight ratio. I have an 80cc Vespa and a full car licence that I have held over 10 years will I still have to complete the CBT? It looks from what we can see you will have to complete the CBT or go for a full motorcycle licence. As the Vespa is 80cc it is not a moped. A standard motorcycle licence (A) is obtained if the practical test is taken on a bike of over 120cc but not more than 125cc and is capable of at least 100km/h; after passing the standard motorcycle practical test you will be restricted for two years to riding a bike of up to 25kW and a power /weight ratio not exceeding 0.16Kw/KG; after this you may ride a bike of any size. If you just take a CBT then you will have to resit it every two years, best to go for your test. It looks like the answer is yes – unless you have a car licence. From the Direct Gov Northern Ireland website. I have been riding manual trials motorbikes since the age of 13, with gears. If that changes anything, just found out about the CBT test the other day, baffled. Your experience riding off road will unfortunately be no help for on road riding in respect of the correct licence. 1. You will have to take the CBT course (which will last for two years before you have to retake it). 2. Or pass your motorcycle test. 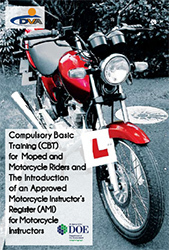 Don’t forget the CBT course will only be delivered by an Approved Motorcycle Instructor (AMI). See links to NI Direct Gov and DVA websites at the bottom of the original article above. We cannot find anything official issued that says CBT issued in the rest of the UK will be accepted in Northern Ireland or vice versa. However from information that we have from the group meeting to implement CBT we believe that the CBT will be accepted. Sorry we don’t have anything more concrete than that but will post up when we hear any further information. Yes you can still ride now and for 12 months after CBT comes in. But I would get your motorcycle test as soon as possible and check out what the waiting list is like for taking your test. Don’t wait until you have a month to run, take training and then find out you can’t get a test date or take CBT before the 12 months is up! If you are heading to the Motorcycle Show at the Kings Hall next week the Driver & Vehicle Agency will be in attendance at the Show and their stand will be available to provide information on Compulsory Basic Training (CBT). Staff will also provide information about the mandatory Approved Motorcycle Instructor (AMI) register. Compulsory Basic Training is to be introduced on 21st February 2011. This is purely a money making exercise for the DOE, instructors and insurers. Wait until those without CBT try to insure themselves this year (it is already a question on some search sites). If a license allowed you to ride a motorcycle then this should not be able to be removed, altered or affected in any way, for new riders fair enough, but not implemented retrospectively. Can you imagine the reaction if they decide to limit car drivers to 1000cc until the driver pays for, trains for and takes a new test? How this has been allowed to be implemented I will never know. How much is affordable in their eye’s cause a lot of 125 riders use their bikes for work to save money, but then also to have to do this every 2 yrs is nuts..!! This isn’t including the price of lending their gear if u don’t have suitable gear that’s up to their standard. You can find some details of what is required to complete CBT in this document Click Here – page 8 which sets out the 3 modules which include five elements. For example: Practical Riding – Pre Road Ride Briefing – Practical on-road riding (minimum of 4 hours). A Minimum of 4hr’s practical on road riding. Now this to me is full of it..!!! Cause 1 lesson is £20-£25 depending were ya go so that’s another £100 so that to me is £200 just to do the CBT…!! I don’t disagree with the CBT but were is the justification on charging us that much n telling us that we need 4hrs practical on road riding..?? JB: So with out doing the CBT my advice would be to go for the full licence cause its only an extra £50.. I would agree but this is for the first year after the introduction of CBT where they have given this time limit if you already have a provisional licence. After then you will have to do CBT to get on the road, plus a test within two years or otherwise redo the CBT. JB: I don’t disagree with the CBT but were is the justification on charging us that much n telling us that we need 4hrs practical on road riding..?? The legislation – Practical on-road riding (minimum of 4 hours) some riders may even take longer depending on their ability. The legislation doesn’t set out the costs just the time and hopefully that will find a level between the commercial instructors. I know this isn’t an answer but we have what we have now, the legislation that is now in place for taking CBT I believe is the best given the circumstances. Hi all, could anyone answer this? Is it legal to ride in Ireland on a UK CBT? Hi Jimmyboy good question and one we don’t have an answer to. But we will try to find out! Thanks to David McGuckin from Ballymena Rider Training http://www.ballymenaridertraining.co.uk for finding out the answer to your question Jimmyboy and a few others that we have been asked. Is it legal to ride in Northern Ireland on a Southern Ireland Initial Basic Training (IBT)? If they are riding on a RoI licence then the answer is Yes. Is it legal to ride in Southern Ireland on a Northern Ireland CBT? If they are riding with a NI licence then the answer is yes. Is it legal to ride in Southern Ireland on a GB CBT? If they are riding with a GB licence then the answer is yes. Is it legal to ride in Northern Ireland on a GB CBT? Yes, the NI legislation recognises the GB CBT certificate. Although the questions ask if it is legal, the other question would be if each of the authorities recognise the others to lead to taking a motorcycle test in that country. The legislation for both the NI and GB CBT currently states that you must have a NI or GB provisional licence before you can take CBT. In relation to taking a motorcycle test (I have assumed that this is the practical test) if someone from the ROI wanted to take a test in NI they would first have to meet the residency requirement if this is met they could take a test in NI. I assume there is no answer yet from DSA if they will accept the Northern Ireland CBT? GB are unable to accept the NI CBT certificate at this time as this will require a change to their legislation. They have advised that they will make this change at the earliest opportunity. I think the CBT is unfair to a new rider I went and got a Honda XLR 125cc RW, motorbike and my licence and all my gear and u twats bring out a bloody CBT just before I was going to get my insurance. I am f##king raging. also how much is the CBT going to cost and were in Ballymena can i do it. First “us twats” didn’t bring out the CBT it was “government” we were represented on the committee that implemented the CBT and I think the best possible deal was put through the legislative process. Can you let us know how your insurance was affected? Regarding the cost of the CBT see some of the previous replies plus most charge £20 per hour so with the minimum four hours on road that is £80 to start with. Possible that CBT will take around ten hours or so of training so around £200. Somebody with prior knowledge could shorten and cheapen that. But if somebody goes in “cold” to CBT e.g. Doesn’t bother looking at a highway code, could end up having the instructor teaching them the highway code and that alone could take days! Karl if you already have a provision licence then we would recommend going for your full test and not CBT. For the full test, the Theory is £30, Part one practical £31 and part two is £58. Lessons to pass it all somewhere in the region of eight two hour lessons costing about £320. So, not cheap but then you have it for life and don’t get affected by any future changes. No set fee but “commercially” driven so you can get the best deal a trainer is offering not just on price but the skills to train you. Why can you not ride your scooter? Have you not already got a provisional licence? Which means you can still ride until Feb 2012 when you require at least CBT. Did you intend not to ever do your licence? You can on your provisional licence go for your full test at present. I think its another money making racket dreamed up by those sitting in an office looking something to keep them employed for another while. Every new law that comes out seems to be designed to force more money out of the average motorist. Those who support this idea either must have nothing else better to do with their time. Im now 36, have been riding 125cc legally since I was 17 and last week my insurance company refuses to renew without a CBT certificate. FFS I done my HGV licence 12 years ago and have been driving artic trucks round Europe for years, carrying just about anything to anywhere and now when i come home I cant jump onto a measly 125cc 4stroke Suzuki with top speed of about 55mph downhill because of some twats idea for more red tape. Couldnt be arsed with it, definitely not going to be playing along and signing up for a course. I only be home twice a month and usually average only 500 miles on the bike in a year, so spending that much cash on a piece of paper to say I can drive this wee toy is pointless. I had never intended to own a bigger bike so never seen the need to do the full test. So all that this new law has accomplished is to make me change from being a legal driver to being an uninsured driver from next month. I might as well get a bigger faster bike if I’m not goin to have to worry about having it legal, after all, your much less likely to get stopped while driving a 600 Bandit than a DR125 with “L” plates around the town. Great work guys who thought this CBT would be a good idea. 17 years experience in cars, 3 weeks training and 2 HGV tests, 12 years truck experience and still cant drive a 125cc? Yeah right, I will take my chances anyway. Regarding your insurance, can you tell us or email us directly at trevor.baird@righttoride.co.uk who your insurance company or broker is? Because you do not require a CBT until February next year so looks like the insurers are jumping the gun on this. No matter what you actually think of CBT there was a year put in to let people, who are riding on a provisional licence prior to the introduction of CBT, to get their CBT or pass their test. I will not be renewing my scooter insurance and will be selling my scooter come July. I am disgusted with the greed in this Country. I am pretty sure that there will be plenty of people that are thinking the same as me, will simply drive their car and sell their bike. I have been riding a 125cc for 20 years now, I am now age 37, I refuse to pay my hard earned money for the CBT test, so the bike must go. Totally disgusted! But reading this mean I am ok? I have held a Car licence for 10 years and i want to get a Scooter 125 or RS125 bike. Do I need to complete my CBT? From what you have said your car licence because it was issued before the introduction of CBT in February 2011, also means you have a provisional entitlement for a motorcycle – 125cc. So you have two options before 21st February 2012. 1. Complete a CBT which will last for two years before you either have to retake CBT or pass your motorcycle test within this two year period. 2. Complete your motorcycle test before 21st February 2012. For cost and not having to “redo” your CBT in two years time we would recommend doing your motorcycle test. Another advantage to do your motorcycle test now is that you will have a restricted two years on a bike not exceeding 33 1/3 BHP. After two years you can “automatically” move up to a full powered motorcycle. However a new European test is due in 2013 and you may get caught in this new system, having to take training or another test to move up to a larger bike. Your welcome, as most training schools can offer the use of their bikes for the test and training then you won’t have the expense of buying one before you pick your bike for after the test. Can anyone recommend a bike instructor in Antrim area? And any idea how much lessons are? I just want to complain about the CBT test, I have been riding 125 bikes for 30 years and have a full car license since 1989, I think it is disgusting I have to do a CBT when I hold a clean license for both – I have completed PSNI bike safe and passed, this is just a money racket, I use my bike for travelling to and from work, which is a ‘greener’ mode of transport, I care about the environment, but at the end of the day I will not be paying money to suit the fat cats of Stormont, I’ll use my car instead, I was doing my bit to cut CO2 emmissions but they are forcing myself and other like me to take this action..
Just hope they don’t think they can count on my vote!! People have enough to pay to keep any sort of motor bike on the road with the rising costs of insurance, without having the addition of up to £300 every two years for the CBT test ?? I’ll not be paying it – I’ll just start using my car instead. This is a way for creating jobs and keeping the money pouring into Stormont – Well they won’t be getting any of my hard earned cash!! I passed my car driving test in october 2010, if i buy a 125 motorbike do i need to do a CBT? The quick and short answer is yes! But before Feb 2012, as we said before the CBT will last for two years so best before Feb 2012 to take your full motorcycle test. Hope this helps and check your for local AMI (Apptoved Motorcycle Instructor) http://www.dvtani.gov.uk/ami/amilist.asp to see what they offer and best suits your needs. I cannot understand the complaints about new test, when you think of the number of motorcyclists killed or injured every year. I have a full car bus lorry license, but a motorbike is a totally different vechicle, I have passed the offroad test will be taking onroad test soon. I would advise anyone on L license to go for the test as soon as possible as the closser it gets to feb there will be a rush resulting in long waiting times, I had to wait 4 wks for offroad and onroad is the same. If I have pass my car driving test in England on july 2009.Does this mean that all I have to do before Feburary 2012 is take and pass my theory test and take and pass my practical motorcycle test to obtain my restricted motorcycle license? Also, I’ve noticed many motorcycle schools offering CBT for £175 plus in Northern Ireland however, England and Scotland and Wales is generally £100-£150. Any reason for the price difference here? Regarding the licence question we are finding out the correct answer for you. Regarding the cost of going through CBT her,e there is no real answer, as the CBT costs are set commercially by the rider training schools and trainers, not by government. So could be cost of living, cost to make a living etc. Just in from the DVA. It another money racket again, similar idea to the truck CPC test they introduced few years ago, its costs £50 per class, minimum of 5 classes per 5 years and claimed to be an E.U. regulation, except that France, Germany, Holland, Italy are refusing to inplement it saying thats its an unfair expense to experienced drivers, so just where in the E.U. did this daft idea come from then? Simple, the U.K. looking for another motoring tax. So this cbt test in N.I. has all the signs of just another tax, honestly after driving a HGV for 11 years and my 125cc Suzuki for 19years now, what do they expect me to learn by paying £280 every 2 years for driving lesson? Me thinks the best option now is to say stuff it, and drive it anyway. The insurance wont cover without it and the fines are tiny even if you are stopped. So as im now coming 52years old and have never wanted a faster bike, I see no point in constantly forking out more money every 2 years for a cbt than I spend on fuel driving it for 2 years. The conclusion I have now is thats is best for me NOT to try and insure it, tax it or mot either, and just drive it anyway, the cost of the cbt+insurance+tax+mot test (totals £580 every 2 years) is much higher than any fine im likely to receive. I like your way of thinking Joe and find it ridiculous I have to be taken by the hand now at a cost. This rule should have applied to all new owners only. Think I might just do what youve said as well. Stuff em!. I’m exactly the same, have a 125cc, driving it 9yrs, and a clear record. Treating experienced riders like kids now. I think it’s a good idea for new learners to help minimise the risk of accidents, but as I have 6 years no claims and been riding bikes for a mere 11 years, was planning to take test in March, but now government have brought this legislation into order, what exactly does this mean, do I have to do the CBT before I can do my practical?. How much does the cbt cost and can I do it in one day? I also think the government are so behind in times, they are only now introducing a new law for learner drivers to be able to drive on motorways with their instructor because of number of young deaths on motorways.. the car & bike theory test both have questions about motorways what use are they without practical examination?. This law should have been brought forward 20 years ago both for bikes & cars, would definately have minimised a number of deaths on the road. Complete hippocrits too busy lining the tax mans pocket. I assume you have a provisional licence that allowed you ride a 125cc bike on the road unaccompanied? CBT was introduced last year on 21st February 2011, basically riders with a provisional licence where allowed a year to take a motorcyucle test without having to take CBT. As a provision licence holder for a motorcycle you should have received in the post information from DVANI on CBT? As this deadline is past, you will have to take CBT before you can do your practical. Yes I agree with you that the introduction in driver training and I would also say rider training, to allow learner drivers to be able to drive on motorways with their instructor should have been introduced years ago. Also I would say as they are suggesting that learners would not be restricted to 45mph restriction. I currently hold a full car driving licence and I would like to obtain a CBT certificate. Is my current driving licence automatically a provisional motorbike licence? or do I have to apply for a provisional motorbike licence? I am assuming you want to obtain a CBT Certificate so that you can ride a 125cc bike however it is to ride a moped I have included this in my reply. Check first the back of your licence, it should have the categories you are entitled to. So in order to be eligible to take a CBT course you need a provisional Category A (motorcycle) or P (moped) licence. A moped is defined as having a maximum design speed not exceeding 50 kph (approx 31 mph) and an engine capacity no greater than 50cc. Moped – If you passed a car driving test before 21st February 2011 you will retain full entitlement to a moped licence. You will be able to continue riding a moped without completing a CBT. Moped If you passed a car driving test after 21st February 2011 you should have received a full moped entitlement on your licence but you will have to complete a course of CBT once in order to validate this full moped entitlement for life. Provisional Category A (motorcycle) If you have a car licence issued before the introduction of CBT in February 2011, you should have a provisional entitlement for a motorcycle – 125cc. So you should not have to apply for a Provisional Category A (motorcycle) licence, however to ride unaccompanied on the road as a learner rider you would have to compete a CBT course. However bear in mind the CBT certificate lasts for two years, so you would need to retake CBT if you havent passed and obtained a full motorcycle licence. So much for letters coming out to explain all this. I rode bikes for years but never done the test. Now that I am in my mid 40’s and can afford the bikes I always wanted this is seems to just put me off. Why does the DVLA not advise things like this publically or on TV adds, simply because they do not want to tell people as they want to make more money. Yes it make sense but unless your advised about it how can you tell. 12th March now if I had know test would have been done months back. As you have rode bikes for years without doing the test then I assume that is up to a 125cc. Well you could do the CBT and ride a 125cc then wait until next year, January 2013, when you will be able to complete Direct Access with the new licence scheme coming in and when passed ride whatever cc of bike you want/afford. Admittedly I don’t think the DVLA put out any TV ads but they did advertise elswhere, we reported on it for over a year. Trying to book a CBT course for my son. Being quoted around £200 in North Down. If we were in England it would be around £100. Can I assume he will get twice as much training here, or is this an example of a rip-off in Northern Ireland? Glad to hear Direct Access is coming in here to match up with the rest of the UK pitty it is January next year before it comes in though. Other option is for guys out there to go Scotland for nice wee break and do a crash course for Direct Access plus by sound of thing their training is cheaper. I rode bigger bikes than 125cc on the road… gasp you say but we did things like that back in the day. I was wondering if anyone can help me – I have prov allowance on my NI driving licence for motorbike. I want to do DAS in England/Scotland as i do not want to be restricted to a 33bhp machine in NI for two years after taking all tests. Are you allowed to do this? Can you go to Scotland or England and take tests and then get the full category put on an NI licence? Also, for all in NI – the rules are changing again in Jan 2013 re A/A1 categories, now you get both if you do your cbt, theory, off road and on road tests. Come Jan 2013 – they are splitting it, making you do more tests for both parts…..
Will get a difinative answer on DAS in England/Scotland. You don’t say what age you are and I suppose I should’nt ask 😉 but if you are on a provisional licence and are aged 19 you can take the new A2 licence in Jan 2013 which has a two year restiction. However if by Jan 2013 you are aged 24 or over the new Licence Directive in Northern Ireland will enable you to take Direct Access. So if I wait until Jan next year, what tests would I actually have to do? Category A covers unrestricted motorcycles above 35kW and includes tricycles over 15kW. Please note that from 19 January 2013 all learner riders of category A2 and category A motorcycles must be accompanied by an Approved Motorcycle Instructor (AMI) at all times when riding on public roads. Still waiting for reply on DAS. Here’s what I got on DAS – Direct Access Scheme. There is nothing to prevent anyone, including a Northern Ireland licence holder, who holds Category A and who successfully completes the DAS test in GB from riding any size of motor-bicycle in Northern Ireland. The GB DAS test is therefore recognized in Northern Ireland, however, because we do not have a DAS in NI the licensing system was never set up to automatically process such application and as such they have to use a manual work around. It is suggested that if someone goes down the DAS in GB when they apply to have the category put on their licence they include along with the GB pass certificate a note to advise licensing of the fact they passed a DAS test. When they get their licence back make sure they check to ensure the restrictions have been removed. Or alternatively wait until January 2013. Many thanks for your response and apologies for my delay in thanking you. Glad to say I have cat A provisional entitlement on my licence and I now can choose whether to go to England or wait until next year! Just to throw a bit of a spanner in the works regarding CBT. At the moment GB does not recognise the Northern Ireland CBT, even though the CBT here could be said to be what GB are looking to change theres to. Northern Ireland recognises the GB CBT. Therefore to do DAS in GB you would need to have completed a GB CBT. GB are waiting to change their legislation on this. I was hoping you could advise me further on the Direct Access scheme that is coming to us in Jan 2013. I have just recently passed all the modules and tests for my Cat A license restricted to 25KW for 2 years. When DAS comes into effect, will I have to take the off-road and on-road tests again or just the off-road test? Congratulations on recently passing your Category A Licence. Unfortunately you don’t say what age you are, as one of the main criteria to take Direct Access for a full powered bike is that you must be at least 24 years old. But if you are at least 24 years old when the new licencing comes in and like yourself have a full/restricted for two years licence, then there is chat that you would be allowed to take direct access, without having the two year restriction afterwards. However this hasn’t been confirmed yet. So direct access as after Jan 2013 will be – you must be at least 24 years old, have a valid CBT certificate (only if you do not have full entitlement to A1 or A2) – (that’s the issue you would have an older licence, which while still valid is not an A1 or A2 – new licence) and pass the theory (would you be required to take the theory again) and category A (new category A not your present category A) practical motorcycle tests. Also from 19 January 2013 all learner riders of category A2 and category A motorcycles must be accompanied by an Approved Motorcycle Instructor (AMI) at all times when riding on public roads. There is talk that riders can be trained up to the maximum speed limit for the road they are riding and Motorway riding allowed, see previous paragraph on being accompanied while being a learner, so no 45mph restriction. This would perhaps lead to after passing the test there being no 45mph restriction/R Plates but having to display a similar restriction plate “N” for new rider/driver for two years. Car drivers would also be subject at some stage to this as well. So you can perhaps see why there has been no confirmation yet in cases like yourself at the moment. Apologies for not having a definitive answer and hopefully I haven’t confused the matter more. If I get more news on this I will post it up. Let us know if that’s any help or anything else you want to ask to help get you an answer. Thank you vey much for taking the time to write such a detailed reply. Your response was very helpful to me. I am 35 years old just now, but not quite a new comer to the wonderful biking world as I rode bikes and scooters when I was a bit younger, but decided not to do my tests until recently. However, I am quite in favour of the restriction rules to 25kw after passing the practical tests for new riders because I do believe that safety on the roads is paramount and experience on bikes is the only way to develop a safe attitude towards riding. With this in mind I am quite prepared to take all tests including the theory again if it was requested to in order to complete a direct access course but I would dis-agree with this course of action being endorsed by the authorities as it is a very time consuming and expensive route for some riders to undertake, if they are limited to the same restrictions as I am and wish to take the direct access route. I have asked the question to a number of instructors about what tests will have to be re-taken for direct access and they all seen to reckon that In my case is will only be required to take the off road test again on a bike with appropriate engine capacity to lift my restriction, but so far I have not been able to uncover any solid evidence to confirm this. Trevor, in your expert opinion, what in your view should be the best way for someone in my position with a cat A restriction to take the direct access – do you think that the theory test, off road and on road tests again, or do you think that both or either one of the two practical tests would be enough to prove that a person is competent and capable to control a motorcycle of any cc capacity or power? Thanks Paul you are welcome. My opinion in your situation is that yes you should be able to take the Direct Access route to lift your restriction. 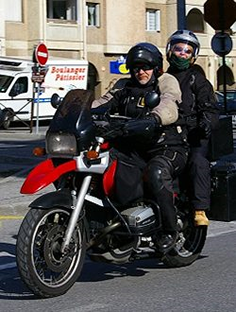 As a rider presenting yourself to an AMI (Approved Motorcycle Instructor) they, if they have been your instructor, should know your level of competence or if going cold to an instructor then within a short period of time they should be able to see what level of competence you (a rider) should have, to go forward with Direct Access. What should be entailed in taking Direct Access in your situation a rider, 24 years, passing the old test on a two year restriction. A further practical test for larger bikes of at least 35kW. When you’re practising on a larger bike you will be classed as a learner rider. But in your case you already have a full test but restricted but you should be able to continue to keep riding your bike as normal as it is still restricted (eg Riding to and from the training). So my opinion would be a further form of practical test, with training to recognise a riders competency before taking the test. I will try to find out from DVA to uncover that solid evidence. The motorcycle test is specified in EU legislation and refers to a test which includes special manoeuvres which are the manoeuvres we have chosen to conduct off-road and form part of a two part test (off-road and on-road). As such everyone coming for a motorcycle test must complete both parts of a two part test. If a candidate takes an off-road test prior to the directive start date they would only have been able to take it on a bike up to 125 cc as such if they wanted to go direct to an A2 or A they would first have to meet the age requirement and take an off-road test on the category of their choice. The A2 off-road test will cover the rider for A2 practical test and below (A1 and AM) and the A off-road manoeuvre will cover the rider for any practical test. Whilst you have already passed the motorcycle test if you want to remove the power restriction you will have to take the two part test. So to remove the power restriction on your licence gained before Jan 2013, you would have to take direct access, which includes two part test – off-road manoeuvres and practical on road test. But the good news is – no theory test. Thank you for taking the time to find and pass this information on for me. I will keep an eye on the DVLNI website and get my off road test booked as soon as I can. I will keep you informed of my progress and any hic-ups or anything relevant that I come accross during the Direct Access tests as I do them. Yes please keep us informed on how you get on and all the best towards gaining the “full” unrestricted test. hey, I was wondering, i don’t have any driving license at all, and I want to get a scooter 45 cc to get to work everyday, What I have to do step by step to get license to ride scooter? Hi there, thanks for your query. With no driving licence then the minimum age to ride a moped is 16 years. You will have to complete this through an AMI (Approved Motorcycle Instructor) details on NI Direct – Click Here Assuming you are from Northern Ireland. Your CBT certificate lasts for two years, so you will have two years to either take a full test, or retake your CBT to continue riding legally. If you take a full test it depends on what age you are for what category (power) of bike you can do a test on. Hi, I’ve been looking at the prices online for a CBT, here it sees the going rate is £175 or so, but on the mainland it seems to be about the £100 mark. Anyone know why it is much dearer in Belfast? While on the mainland in Element 5 it is a minimum two hour on-road ride. This may be part of why there is price difference. Good luck with the CBT and remember cheapness doesnt necessary mean quality. If you can ask around for recommendations from other riders, word of mouth is great! There are two aspects which could make it feasible for you to get your test for a motorcycle over 125cc. That is assuming you are 24 years or older and want to go for a full A licence. You are doing the test in Northern Ireland. First it would depend entirely on the DVA (Driver and Vehicle Agency) booking system as you would have to book your dates for the theroy test, the off road manoeuvres and on road test to line up in the same week. Also considering that if you pass the theroy test and the off road manoeuvres these passes take 24 hours to clear the DVA system! Also depending if you have ridden a bike before it would depend on how long it would take you to pick up the skills required to past the off road manoeuvers test and on road test. i.e. How many lessons you would require and fit those into one week. However more importantly it should depend on your AMI (Approved Motorcycle Instructor) if they are confident that you have the confidence in your own capabilities to take the off road manoeuvers test and on road test and that you are a safe and a capable enough rider that has required the essential skills and knowledge capable of safely operating a motorcycle in normal traffic situations on public roads. Thanks to Victor Rodgers from Ridesafe Car & Motorcycle Training http://www.ridesafeni.co.uk for helping with this reply! I do not know the answer at the moment but I will find out for you. Here is the advice and feedback I have received regarding your queries. You should be ssued with a provisional licence which means you will be subject to all the requirements of a provisional licence holder, which means to ride on the road you will have to take CBT (Complusory Basic Training) and display an L plate. This will be a 125cc bike with restrictions eg Not allowed to ride on a motorway – no passengers.. In addition if you are going to take the test on a big bike – A Licence assuming you are 24 years of age or over, you will need to be accompanied at all time by an AMI (Approved Motorcycle Instructor) until the test is passed eg while being trained by an AMI – you will not be able to ride this category of bike unaccompanied. You will be required to take a theory test, the manoeuvres test and the practical test. If the courts have ruled that you must take an extended test then you can take a test in either a car or a bike the one extended test will remove the requirement from the other category. For example if you have a car licence also you can take an extended car test and once passed it will remove the requirement for you to take a further extended test. However you will still be required to take an ordinary motorcycle test to get your motorcycle entitlement back. Were do you go to book a CBT test in belfast ? Hi Eddie – In Northern Ireland and the rest of the UK there is no daylight restriction on a licence for a 16 year old on a moped. Am 16 with my provisional what else do I need to do if I do my CBT? If you do you your CBT then at 16 then you can ride a moped unaccompanied on the road – insurance and MoT required for the bike – legally requried helmet to wear (fastened up) some strong clothing – – Safety helmets and protective clothing for motorcyclists – NI Direct Government Services – Click Here. Also best to your CBT on a moped with gears eg not a twist and go – your AMI (Approved Motorcycle Instructor) will be able to advise you better. Your CBT certificate lasts for two years – you must retake the CBT if you do not pass a test. The link above explains the complicated route you have to take if you wish to progress eventually to a full powered motorcycle – at age 21 through the progressive access route. Once I complete my CBT in Northern Ireland can I still travel down south? Does anyone know if I hold NI CBT licence on a provisional – Can I go to Scotland? As far as we know you can travel to the rest of GB on a valid CBT ie on a 125cc bike. Although there is no, recognition of a Northern Ireland CBT course for riders in GB if you wish to take a test/training to gain a further licence – A2 – A full licence. As for down South we are not so sure. Rang DVA today. Was told that I am allowed ride in the South on my NI Provisional + CBT for anyone wondering! Wish I had it in writing, but was definitely told that I could do it. Cannot for the life of me find it written anywhere though.